Tensegrity Tube Towers, Boston, MA. gNa+Design is a comprehensive, research-based design practice embracing public art, residential, commercial and retail construction. Focused on the role of design and construction in enhancing meaning in our lives, we believe that sensitivity and innovation are our most important assets. Fully engaged with issues of contemporary life, we listen carefully to our clients, and bring value to their projects through an inquisitive and synthetic approach to program, site and construction that re-imagines possibilities in service to client needs and aspirations. 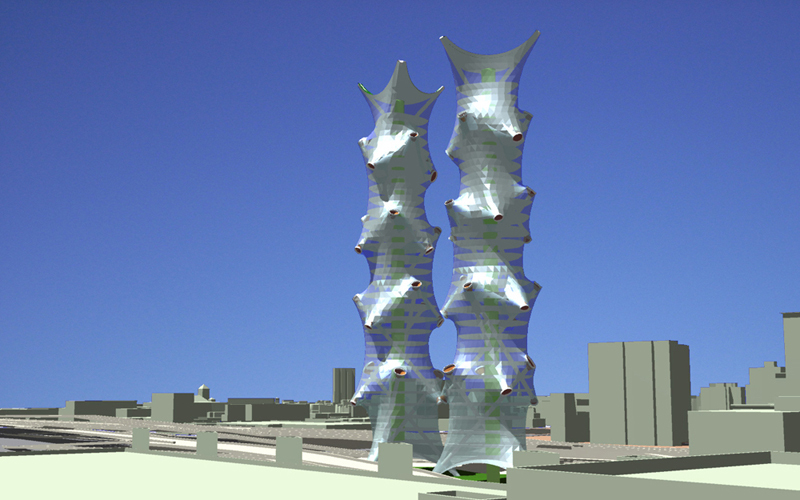 The proposed Fantastic Elastic Thermo-Plastic Tensegrity Tube Tower (FETP3). Work with membrane tensegrity structures, specifically with elongated tube structures, has been ongoing for quite some time, but the recent development of a fully parametric model in Rhino+Grasshopper will lead to the fabrication of large scale protorypes soon. We'll keep you posted! 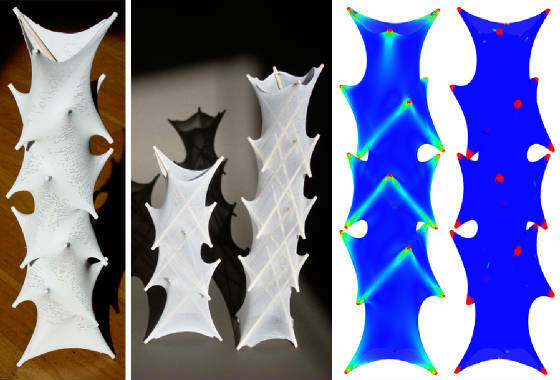 Small scale stretch fabric models demonstrating structural feasibility + mean curvature (blue indicates a mean curvature approaching zero) and Gaussian curvature (blue indicates -.001 to -35) analyses of a computationally derived membrane. In a membrane tensegrity system, a structural membrane replaces the tendons utilized in a typical tensegrity structure. The in-plane tensile forces of the membrane are in equilibrium with the axial forces of the compression struts, and the two discreet sets of elements support eachother. I have developed a multi-tiered tube system, using 3 to 5 compression struts per tier (as physical models, for the most part) inside a continuous sheath to create vertical structures. 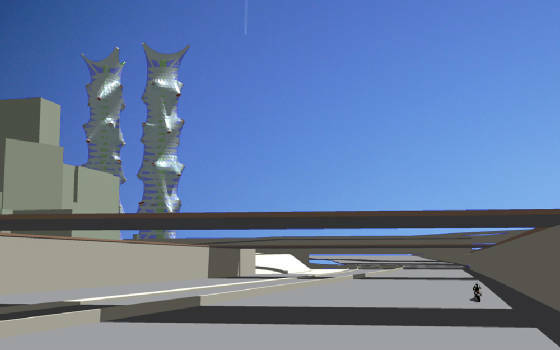 Tensegrity tube towers from Boston's I-90.